The Visitors Pavilion provides an evocative place to rest and reflect upon one’s experience of the 100 Acres Art and Nature Park. 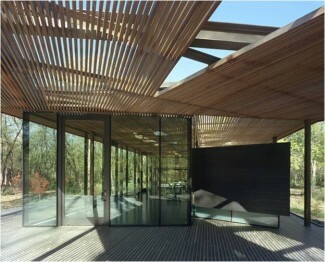 The Ruth Lilly Visitors Pavilion is the result of a studied relationship between building, land and art, and serves as both a threshold and a destination within the 100 Acres Art & Nature Park at the Indianapolis Museum of Art. An ipe screen lines a steel exoskeleton forming deck, wall and canopy, wrapping programmatic elements. The pavilion is constructed to touch the landscape lightly and allow for the free flow of rain and filtered sunlight through the structure. The interior space is surrounded by glass on three sides in addition to the skylight ceiling above, allowing visitors to maintain a powerful connection to the natural world around them. The building provides a versatile gathering and education space, restrooms, and emergency services. Carefully sited and in the woods of 100 Acres, the ADA accessible building is accessed by the park’s network of pedestrian Landscape Journeys. The Visitors Pavilion will be LEED certified, with careful attention paid to environmental sensitivity and energy efficiency throughout design and construction. Water saving fixtures are fed by on-site well water and a geothermal system provides heating and cooling. The Visitors Pavilion and surrounding landforms are carefully designed to inhabit the floodplain environment of 100 Acres, allowing occasional floodwaters to pass around and beneath the structure.